Description: These slender vines can grow along the ground or climb trees. They have green stems, usually becoming woody at the base, and light green leaves with somewhat of an ivy-leaf shape. 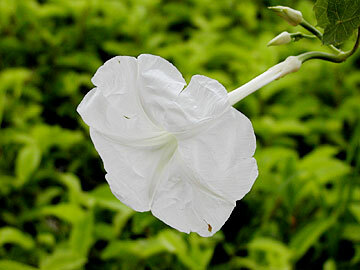 The flowers are white, 2 to 3 inches in diameter with a 2- to 4-inch tube and a 6- to 8-inch stem. These flowers are nocturnal -- they bloom at night and stay open until about midday. The blooms look very nice drooping over a trellis. Distribution: This vine is found only in Hawaii, making it an endemic species. It can be found in hot dry forests, rocky slopes or even on 'a'a lava on all the main islands. I've seen it on the Kealia trail behind Dillingham airfield in Mokuleia. Cultural uses: Although there is no known documentation of this plant being used for any one purpose, that does not diminish its importance to Hawaiian culture. Many other members of the genus Ipomea were used medicinally and also for food (sweet potato, or 'uala, is Ipomea batatas). Landscape use and care: This is another ideal candidate for a moon garden as its large, white flowers bloom at night and shine in the moonlight. As stated, it can be used as a ground cover or to embellish another tree or trellis. It loves full sun but can tolerate partial shade, needs very little water once established, and few bugs bother it. More stuff: If you're contemplating a moon garden, other plants previously featured in this column would work: maiapilo (Capparis sandwichiana) with white nocturnal flowers and a wonderful fragrance; ohai (Sesbania tomentosa) from Kaena with silvery reflective leaflets that shimmer at night (its leaves also have a great fragrance); any of the native white hibiscus, but primarily hibiscus waimeae from Kauai, because its flowers last longer (they, too, also have a slight scent); 'olena (Curcuma longa) has a nice white ginger flower cluster that protrudes from a long stalk; and alahe'e (Psydrax odorata) with tons of white flower clusters that stand out against dark green foliage. Basically, any white or light-colored flowering plant or silvery/reflective foliage plant would also do. Rick Barboza is co-owner of Hui Ku Maoli Ola, a native Hawaiian plant nursery. E-mail rickckbarboza@aol.com. "In the Garden" runs Fridays.